من اليمين إلى اليسار، نظرية تطور الموقف العربي الرسمي من مقاتل عربي الى يهودي صهيوني. La théorie de l'évolution de la position Arabe officielle » – de droite à gauche, du combattant Arabe en Juif. 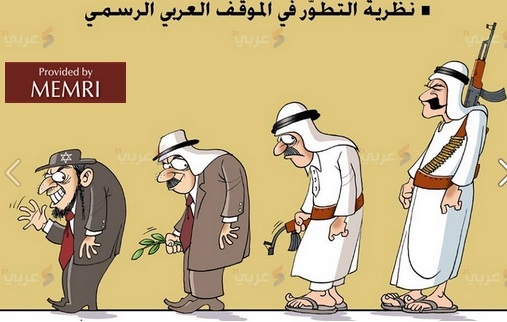 From right to left, The theory of evolution of the official Arab position, from an Arabian fighter into a Jewish.